A Life of Sugar and Spice: Oh Baby! This is the first baby of the 5 cousins. Lauren, Stephen, Diana, Dan and I are the 5 youngest of the cousins on my mom's side of the family. Diana and Dan are my siblings and Lauren and Stephen are siblings, they are the children of my mom's brother, my Uncle Ed. We grew up together, have always lived within a few miles of each other, went to the same schools, went on vacations together, spent summers together... we're more like brothers and sisters than cousins. Over the course of one year, my sister got married, Stephen had a baby, Lauren is getting married, and all three of them bought their first homes. It's been a busy year! My brother and I just sit back and watch. 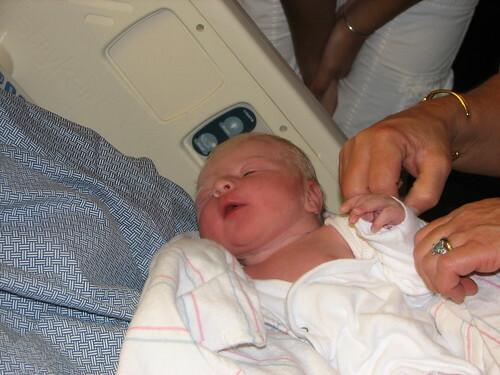 This is Owen, Stephen's son, check out that blonde hair! He's going to look just like Stephen!! I cried a little when I saw this photos. Steve's girlfriend Jess gave birth last night. I am going to the hospital right after work to meet the new baby! He's technically my cousin, but to me it's more like a nephew since Steve is more like a brother to me. I am so happy for them!! Steve is so pumped about being a Dad and he's going to be a great one. I know Jess will be a great mom too. I'm currently compiling a list of local gluten-free restaurant menus but I don't want to post it until I have a bunch so stay tuned for that! So far I have Outback, Uno's, Chili's, Legal Sea Foods, Wagamama and I'm still searching. It's great that more and more restaurants are becoming gluten-free friendly! A few more local additions to your list: The Elephant Walk has a gluten free menu and Not Your Average Joe's does too.